Hi! This blog post is for an assignment for the Fashion Industry Essentials online certificate program I'm taking through Parsons School of Design and Teen Vogue. The assignment is to go to a store to look for an engaging display and write a blog post about why it works. I looked in a lot of stores for this assignment, and the display I thought was the most compelling was one I saw in Macy's. One reason I think this display is compelling is its placement. It is in the center of the walkway right near one of the store entrances, so it's probably the first thing most shoppers look at when they come in the store through this entrance. 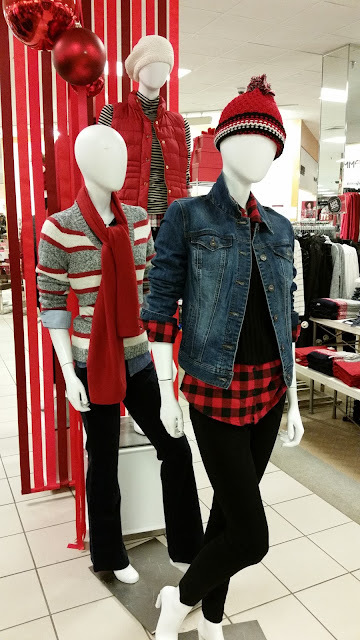 Another reason I think this display works is that it has a unified festive appearance for the holidays. All three outfits have red in them and are for colder weather. Also, there are red ornaments hanging and a red striped backdrop. These features work together to catch the eye and create a welcoming environment for customers so they'll feel excited for the holidays and want to shop. 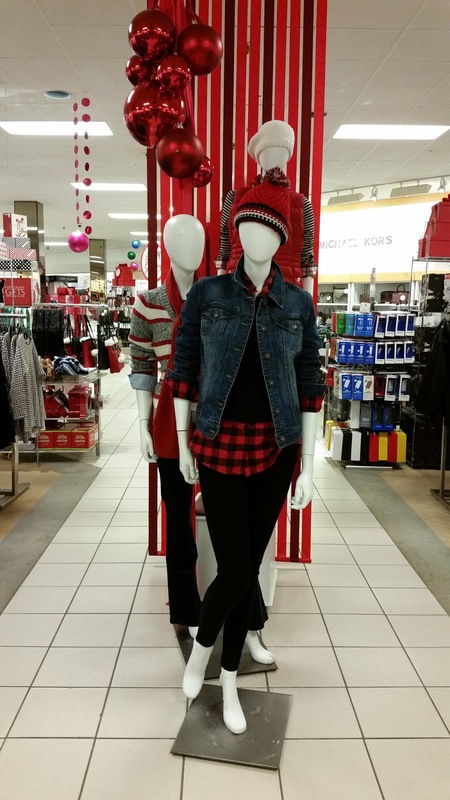 Another reason I think this display is engaging is that it follows the visual merchandising rule of three because it has three mannequins. The rule of three is that arranging products in a group of three keeps the customer's eyes moving so that customers continue to look around, ultimately increasing sales. I also think this display works because it has color (the red in the outfits, ornaments, and backdrop), patterns (the buffalo check shirt and the stripes in the other two outfits and backdrop), and shine in the ornaments. The color, patterns, and shine give interest to the display, which engages customers so they'll want to look around the store. It was good to learn about visual merchandising through this assignment. Visual merchandising is important because it impacts sales, and I think it is a fun way to make stores appealing to shoppers. This assignment for the Fashion Industry Essentials online certificate program I'm taking through Parsons School of Design and Teen Vogue is to write about my social media audience. All of my social media accounts (my blog, Instagram, Tumblr, and Pinterest) use my brand name Prism of Style. I don't have a Facebook page or Twitter account for my brand as of yet. I'll start with this blog. My blog only has six posts (including this one) up to now. My blog has had 522 views altogether since I first started it in May, and there have been 107 views in the last month. There was only one view yesterday and one view today. The audience, in descending order of views, comes from the United States, France, India, and Russia. The highest percentage (43%) of views comes from visitors using the web browser Google Chrome. The next highest percentage (31%) of views comes from visitors using Safari, followed by Firefox (18%), and then Internet Explorer (6%). The number of views of each of my blog posts increases with how old the blog post is. None of my posts have comments on them. One way I could try to increase traffic is by posting more. I'd like to make posts about outfit ideas, craft ideas, and topics in fashion or art I come across that interest or inspire me. Another way I could try to expand my blog audience is by adding meta tags, which include keywords in the HTML code of the blog that describe the content to search engines so that the blog will be more visible on them, increasing the chances that people will visit the blog. My Instagram account only has five posts, and it only has one follower. I have gotten likes and/or comments on four out of five of my posts though; four of my posts have likes, and two of these posts have comments, all of which are thankfully positive. I use hashtags on each of my posts, which I think is how I've gotten the likes and comments on my posts. The post that has the most likes and comments is a picture I took of a hanging crystal decoration at the store Bergdorf Goodman in New York City: it has 12 likes (one of them came from the fashion designer Amanda Uprichard, which I was especially excited about because I like her designs...I have an Amanda Uprichard top) and two people left comments on it. The other post that has comments on it is a flat lay picture I took of a top with iridescent paillettes and accessories: two people left comments on it and it also has three likes. A two photo collage of me in an outfit with the top worn two ways has eight likes. A picture I took of a hot pink rose has two likes, and another picture I took of yellow mums doesn't have any likes. So my style posts seem to get more likes and comments than my flower posts. The follower I have is a health and fitness coach, but she has some style posts. A lot of the people who have liked and/or commented on my posts also make style posts and/or have an art, design, or fashion related profession. Some are fashion designers, style bloggers, photographers, or makeup studios or brands. My Tumblr account only has eight posts, and it only has one follower. I also use hashtags on my Tumblr posts, but using them on my Tumblr hasn't seemed to attract as many likes as it has on my Instagram. My only post that has a like is a photo from the Internet of an Adeen snapback cap. My Pinterest account has more content than my Instagram and Tumblr accounts, but it doesn't have any followers. Some people have saved or liked some of my pins though. I have nine Pinterest boards, but three of them only have one or two pins. The people who have saved or liked my pins are a mixed group, but some of them pin art and style related things. Also, the four pins of mine that people have saved or liked are a mixed assortment. One person liked and two other people saved a photo of a beach scene by Matt Crump that I pinned. The artist Takashi Murakami liked and another person saved a picture I took of a colorful abstract piece of art my cousin made. I was also especially excited that Takashi Murakami liked my picture because he is one of my favorite artists. I think he saw my picture because I mentioned his name in the description of the picture. Another person saved a picture I took of my headphones and iPod, and another person saved a picture I took of my bamboo plant. To attract visitors, all of my social media accounts could use more content. Another way I could try to grow my audience on my social media accounts is to advertise them more. I could tell people I know to check them out and to spread the word about them to people they know. I could use my personal Facebook page to let people know about my social media accounts. I could also advertise my social media accounts through each other by having links to them on each other. This assignment in the Fashion Industry Essentials online certificate program that I'm taking through Parsons School of Design and Teen Vogue, called My Product, was to make a sample of the bag we designed earlier with a stripe pattern that we also design. An earlier assignment called Collection Sample was to create a print on a piece of fabric. The video along with the assignment featured a Parsons instructor who showed how to create a stripe pattern using masking tape and screen printing ink on canvas. The instructor used a bone folder (this link explains what a bone folder is if you don't know, like me before I did the assignment) to firmly press down the tape, and applied the screen printing ink with cardboard strips cut from shipping boxes. I used this technique for the Collection Sample assignment, and I also used this technique on the bag. I had canvas left over from the Collection Sample assignment, so I used that for the bag. 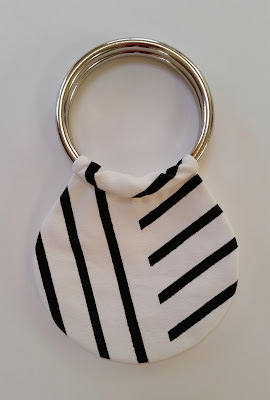 I wanted to make an asymmetric stripe pattern for the bag. I like the masking tape technique because it allows me to create my own prints on fabric. I used the same pattern pieces to make the mockup (I talk about this in the last blog post) and this bag. Another part of this assignment was to calculate the cost of producing our bag. The production cost grid is below. I figured the cost of the masking tape and screen printing ink was only 10 cents because I only used a small amount of each. The cost is higher than I wanted it to be. The main reason for the high cost is the labor, so I would try shorten the production time to lower the cost. Making this bag was a good experience. It has made me want to keep experimenting with making bags and using the masking tape technique! This assignment for the Fashion Industry Essentials online certificate program I'm taking through Parsons School of Design and Teen Vogue was to create a mockup, or prototype, of a bag we designed for an earlier assignment. 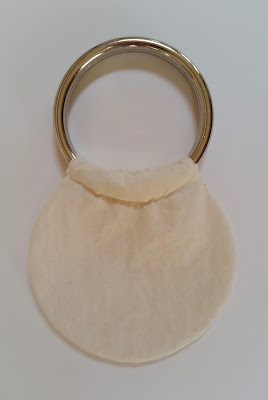 I designed a round shaped bag with silver tone metal circle handles because I like bags with ring handles, and I thought the circle shape of the bag goes well with the handles. The assignment said to use oaktag (a manila folder-like cardboard paper), light card stock, or muslin to make the mockup. I decided to use muslin because I thought it would work best for the shape of the bag I designed. Also, since I've never made a bag I've designed before, I wanted to practice making it with fabric instead of paper. The bag has a lining layer of fabric to hide the seams and add strength. I used tissue paper to make pattern pieces for the bag exterior and lining because I thought it was similar to the paper used for commercial patterns. Another earlier assignment called Production Inputs was to go to a fabric store and make a fabric card listing the quantity, style, and content information of four fabrics that fit one of the Pinterest boards we created earlier in the course. I decided to pick fabrics that fit a Pinterest board I made called "My Story." I think this board shows that my style is eclectic. I tried to pick fabrics that fit the colors of the board. I picked the Chinese brocade because my board showed that I like Asian things. I went to B&J Fabrics in New York City for the assignment. I've never been there before, and it's a really nice store. 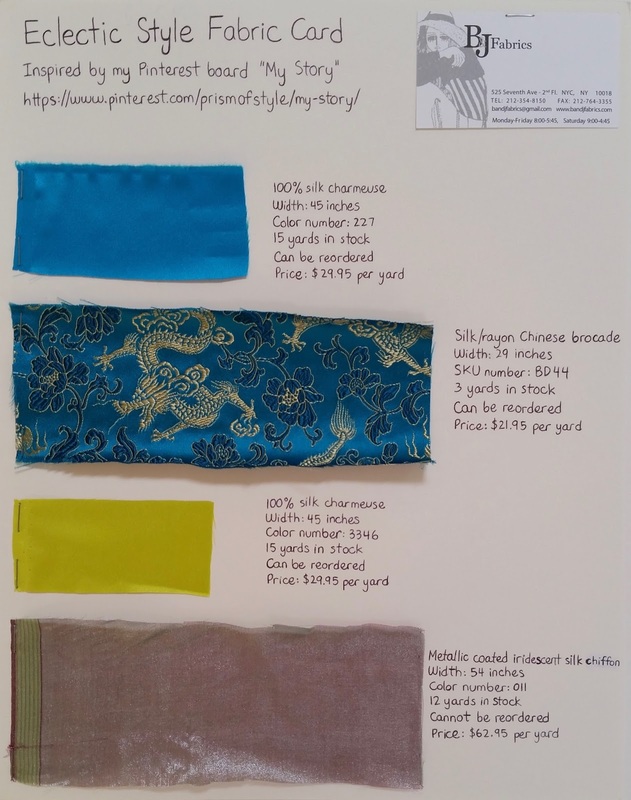 Another part of this mockup assignment was to calculate the cost of producing the bag in each of the four fabrics. The production cost grids are below. It only took about 1/8 of a yard of fabric to make the bag. The prices for the sewing machine needles aren't the same for all of the fabrics because I would use different types of needles for the silk charmeuse, brocade, and silk chiffon. The estimated retail prices for all four bags might be a little high since the bag is small, but I think they are still reasonable because they are made out of finer fabrics. I learned a lot from this assignment. I definitely see the value in creating a mockup for an accessory because in my case, it allowed me to see how the size of the whole bag and the bag opening, the position of the handles, and the construction process worked out before making the final product. I mentioned in my last blog post that I'm taking the Fashion Industry Essentials online certificate program through Parsons School of Design and Teen Vogue. For an assignment called Production Standards, we were asked to go to a store that carries different brands and try on various articles of clothing, like tops, bottoms, dresses, and jackets. We were asked to pick the item that fit best and try on every "identical" item in the same size to see if there were any differences between them. I decided to go to Macy's for this assignment since it carries a number of different brands. It was fun to look around Macy's and pick out clothes. I found some good stuff! I tried on a lot of clothes. Including number and letter sizes, four different sizes fit me well: two different number sizes and two different letter sizes, which emphasized to me that it's important to try things on because one single number or letter size doesn't always fit me best. I tried on a Karen Scott three quarter sleeve top in a pretty pool blue, which was a letter size, but it was too big and they didn't have a smaller size. I also tried on International Concepts (INC for short) tops in the same size as the Karen Scott top, and they fit well. So the same size in different brands may not fit the same. The Karen Scott top might have been bigger because Karen Scott seems to target older women, while INC seems to target younger women. 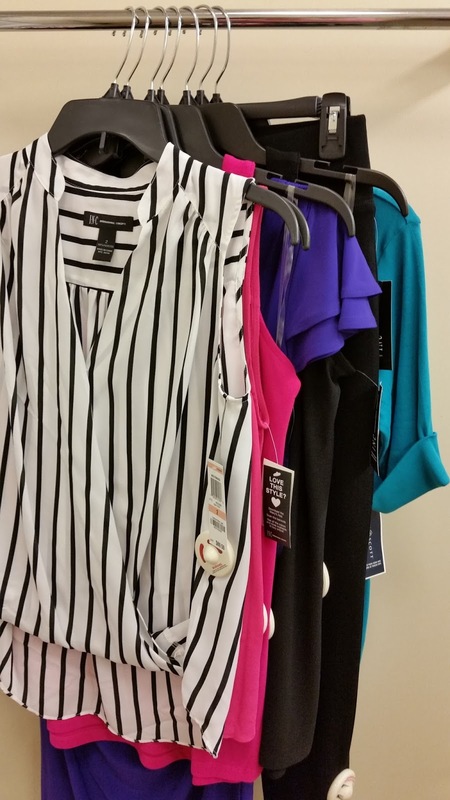 Here's some of the clothes I tried on in the fitting room. I liked the combination of pink, purple, blue, black, and white. I've been looking for something with black and white stripes, so I bought the INC striped top in the front. The Karen Scott top I was talking about is in the back. The picture unfortunately doesn't fully do the pretty color of the top justice. 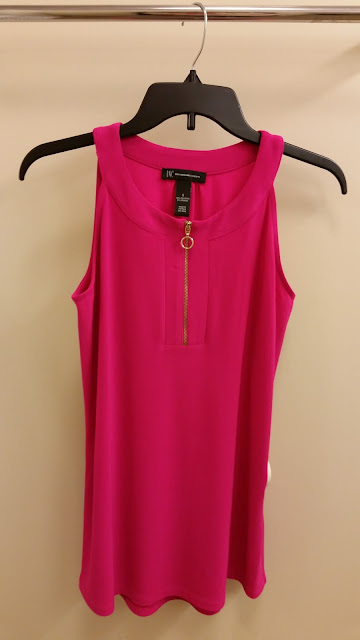 I picked an INC sleeveless top for the item that fit best and I tried on every identical top in the same size. There seemed to be subtle differences in the overall length of the top and in the size of the armholes: the underarms on some of the tops were slightly lower than on others. I thought this assignment was interesting and valuable because I never thought about the differences between identical items that are the same size. I always assumed that they are the same, but now I realize that isn't always true. I never thought about the fact that there's human error involved in fashion production, even though it can be subtle. Here's the INC top that fit best. I tried on all of the tops identical to this one in the same size in this color and in different colors and patterns. I bought it in this color (I love hot pink) and in black. I love the mod look of it and the circle zipper pull. I'm taking an online certificate program called Fashion Industry Essentials through Parsons School of Design and Teen Vogue. One assignment was to design an accessory. 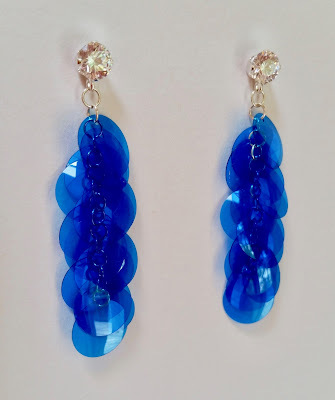 I designed earrings made with these beautiful transparent blue paillettes that I connected with jump rings. I used ear posts with cubic zirconia stones to add sparkle. Another assignment was to calculate the cost of making our accessory if we were just selling one or a few of them, and the cost of making it if we were selling a lot of them, or wholesale. The table below called Transparent Blue Paillette Earrings #1 shows the cost of making the earrings if I was just selling one or a few pairs of them. The assignment said to use a wage that we would expect a local clothing retailer to pay us. I used $9 because that's the minimum wage where I live and I wanted to keep the cost as low as possible, because the costs of the materials made the estimated retail price for the earrings higher than I hoped. The table below, Transparent Blue Paillette Earrings #2, shows the cost of making the earrings if I was selling them wholesale. I was able to buy all of the materials in bulk, and the bulk prices for all of the materials was lower. Still, I had to shorten the time it took to make the earrings from 1 hour and 40 minutes to 1 hour so that I could keep the total cost plus profit for selling the earrings wholesale, which was $20.66, under half of the estimated retail price, which was $42.00. I didn't want to shorten the production time any more than I did because I didn't want to sacrifice the quality of the earrings. I never calculated production costs before, so learning how to do it for the earrings I made was very useful. I learned that production costs should reflect the cost of every material needed to make the item, the amount of labor, and a certain amount of profit. Another thing I learned is that the total cost plus profit for selling the earrings wholesale should be less than half of the estimated retail price so that the stores I'm selling the earrings to can also profit and mark down the price of the earrings if necessary. Calculating production costs also showed me that materials cost less in bulk. I also learned that effective pricing considers production costs and quality with the target customer audience in mind. The estimated retail price for the earrings ended up being higher than I wanted it to be. When I made these earrings, I focused more on quality, and maybe not enough on cost. If I made these earrings again, I would try to balance cost and quality more by looking for materials that cost less without sacrificing quality to lower the estimated retail price. Hi! This is my first blog post ever! I wanted to start by writing about why I named this blog Prism of Style. The style part comes from what I want to blog about and what I love-fashion, art, design, and crafts. I decided to use the word "prism" because my style is eclectic-I like a lot of different styles (to name some, 1960s mod, feminine, girly, kawaii, edgy, kitschy, modern, and styles of different cultures, like Japanese, Chinese, Mexican, and Indian). There are also other trends and styles I don't like. I don't like something just because it's trendy, even though I did more so when I was younger. I only like trends and styles that appeal to me. So I think of the word "prism" as describing a spectrum-in my case, a spectrum of style. Also, I relate the word "prism" to the rainbow because a prism creates a rainbow in the light, and my style is colorful and vibrant. I love rainbow inspired style, and I like bright colors.